The role of safety has no boundaries when it comes to the workplace. Both for legal and moral reasons, it’s an employer’s duty to make sure that its staff are safe from harm as much as is humanly possible. There are environments of course where the risk to human health is much greater than say, a shop. Warehouses, chemical manufacturing plants, building sites and places where industrial machinery is in use are all examples of workplaces that are considered inherently hazardous. However, there’s one kind of injury that is prevalent in all workplaces, no matter how large or small: Trips and Falls. 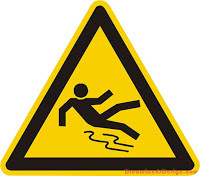 Around 10,000 incidents of trips or slips were reported to the Health and Safety Executive (HSE) in 2008/09, making it one of the most common workplace injuries in Britain. This is likely to prevail all the time that employers aren’t providing – or enforcing – correct footwear procedures and clean floor practices. Other safety measures that can be installed to minimize the likelihood of an accident include anti-slip matting or anti-slip paints for the most-commonly-used areas of flooring. This doesn’t mean the most-used for employees either, as anti-slip matting should also be utilized where there are a great number of members of the public. Keeping them safe is just as important, as a business could face legal action if it was found to be accountable for preventable injuries. On this note, despite commonly appearing in industrial environments, you might be surprised to discover the other locations and diverse industries in which anti-slip matting appears. As mentioned, non-slip mats are often placed in entrance ways to public buildings, or accommodation blocks like flats and hotels. Not only do they fulfill their primary role as an anti-slip measure, but the presence of a mat is also useful for those poor-of-sight trying to enter buildings like libraries or councils and so on. Mats let people know they should stop and normally wait for an automatic door say, bringing a secondary benefit to the fore. The greatest use and application of an anti-slip mat however can be seen in environments where there are likely to be liquid spills. This could include bars, butchers and bakeries. Bars in particular get the most use of out them, because drinks are likely to coat the floor from excess spillage between drinks cabinet or pump, and customer. With up to a dozen people running around at any one time, serving a bar-full, the last thing a business needs is a slip up. Catering establishments like butchers and bakeries will benefit most from anti-slip mats that are treated with anti-bacterial chemicals. With pieces of food likely to drop at any time, it’s vital that the risk of carrying bacteria around a food facility doesn’t walk around with the employee in the kitchen. Exploring just a few of these environments shows how important one safety device can be to both employee and employer.